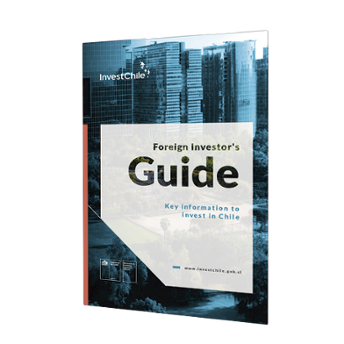 In accordance with the terms of Law 20.848 of 2015, foreign investors who make an investment in Chile as from 1 January 2016 may request a Foreign Investor Certificate which will give them access to the regime established in the said Law. During a period of four years as from 1 January 2016, foreign investors may also request to sign a tax invariability contract in accordance with the terms of Articles 7 and 11ter of the repealed Decree Law 600. In order to request a Foreign Investor Certificate or the signing of a tax invariability contract, an investor must fill out the form below and present it as a printed document in the offices of the Foreign Investment Promotion Agency together with the other documents indicated in the form*. NEW FOREIGN INVESTMENT REGIME – Document setting out the main points addressed by the new Law. LAW 20.848 – Complete text of the new Law on the Framework for Foreign Investment in Chile. *Opening hours Monday-Friday 9:00-17:00, Paseo Ahumada 11, 12th Floor, Santiago.